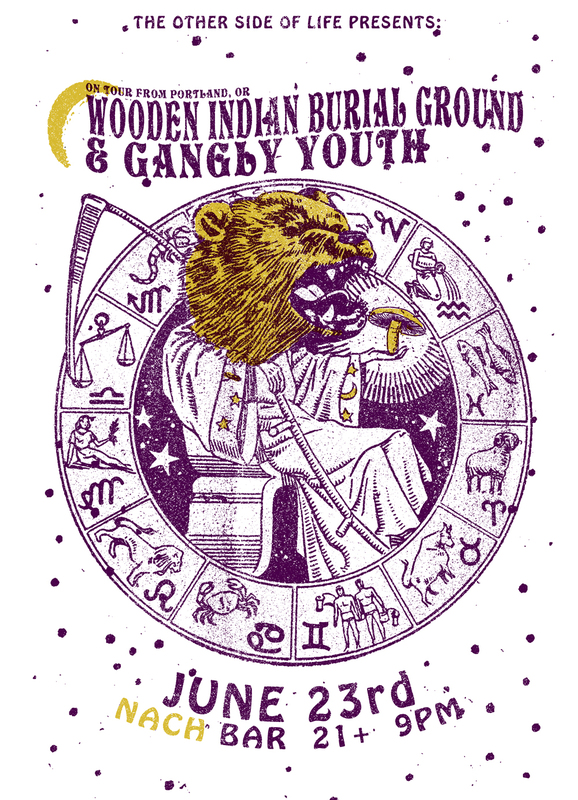 WOODEN INDIAN BURIAL GROUND and GANGLY YOUTH, Monday, June 23rd at NACHBAR. FREE! WOODEN INDIAN BURIAL GROUND formed in Portland, Oregon in 2007. As a duo the band employed banjo’s, chord organs, fuzz guitars and other various instruments, making a glorious racket across the Western, Central, and Southern United States. This incited an 11 track album of lo-fi experimental folk tunes that they self-released in 2008. 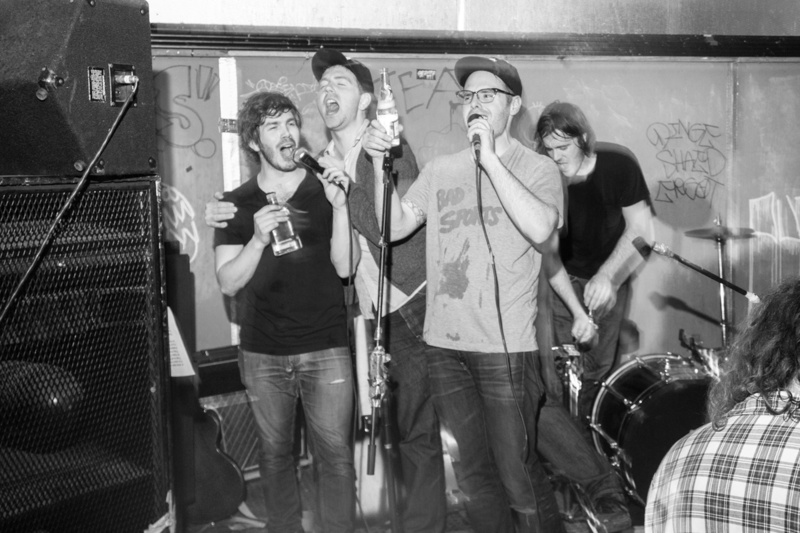 The band grew in numbers and influence, playing shows under various names with various members until settling down with a stable lineup and signing with the Mon Amie record label in 2010. After a bit of a hiatus and some lineup changes and whatnot, GANGLY YOUTH of Louisville, Kentucky return! 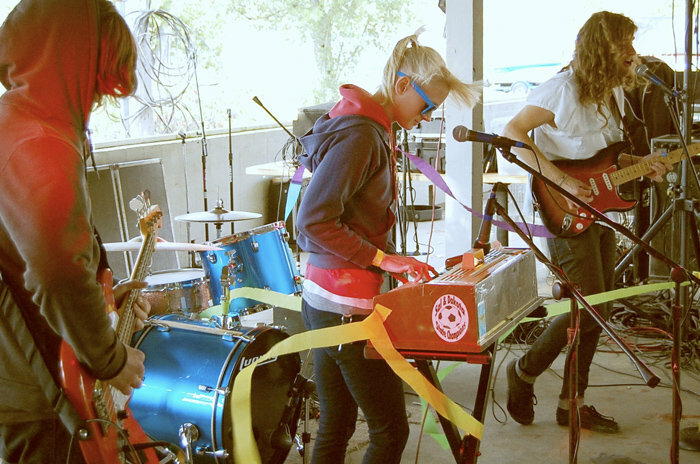 Their sound is a mix of jangly noise, fuzzy pop, and a no-perfection required style. One might be reminded of bands like Sonic Youth, The Pixies, or warped cassettes playing favorite pop songs. Check out the Facebook invitation here: https://www.facebook.com/events/763885653661664. This entry was posted in Activities, Art, Beer, Bourbon, Free Shows, Upcoming Events, Wine and tagged Free Shows, Gangly Youth, Nachbar, Upcoming Events, Wooden Indian Burial Ground on June 4, 2014 by othersideoflife. 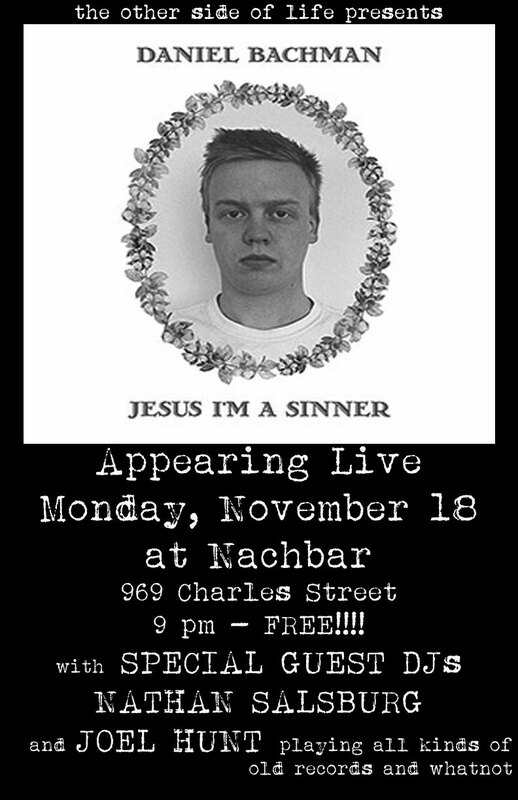 DANIEL BACHMAN with SPECIAL GUEST DJs at the NACHBAR, Monday, November 18th — FREE! 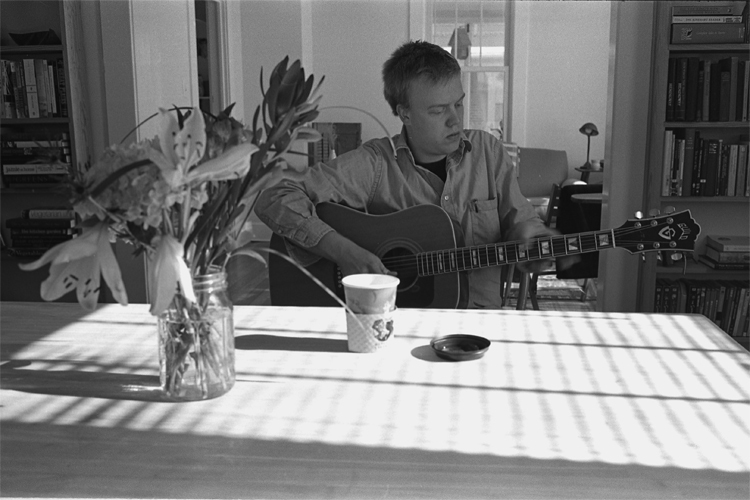 DANIEL BACHMAN is a musician born and raised in Fredericksburg, Virginia. He has been playing what he describes as “psychedelic appalachia” since he was a teenager, releasing small run editions of tapes, CDs and LPs for the past three years, with a sound that evolved from drones and banjos to a now guitar centered focus. Touring off and on since the age of 17, BACHMAN has managed to cover thorough ground across the US, sharing stages with like minded folk such as fellow Fredericksburg native Jack Rose, for whom he fashioned the artwork for the posthumous release of Luck In The Valley. His new album Jesus I’m a Sinner is his 4th, and it is the follow-up to last year’s acclaimed Seven Pines. It was recorded in Rappahannock County Virginia at Forrest Marquisee’s studio inside his father’s woodshop in May of 2013 after spending 8 months on the road. Before and after BACHMAN‘s set, NATHAN SALSBURG and JOEL HUNT will play all kinds of records for your musical enjoyment. Check out the Facebook invite here: https://www.facebook.com/events/602390433137583. This entry was posted in Activities, Beer, Bourbon, Upcoming Events and tagged Alan Lomax Archive, Daniel Bachman, Nachbar, Nathan Salsburg, Tompkins Square, Twos & Fews, Upcoming Events on October 22, 2013 by othersideoflife. 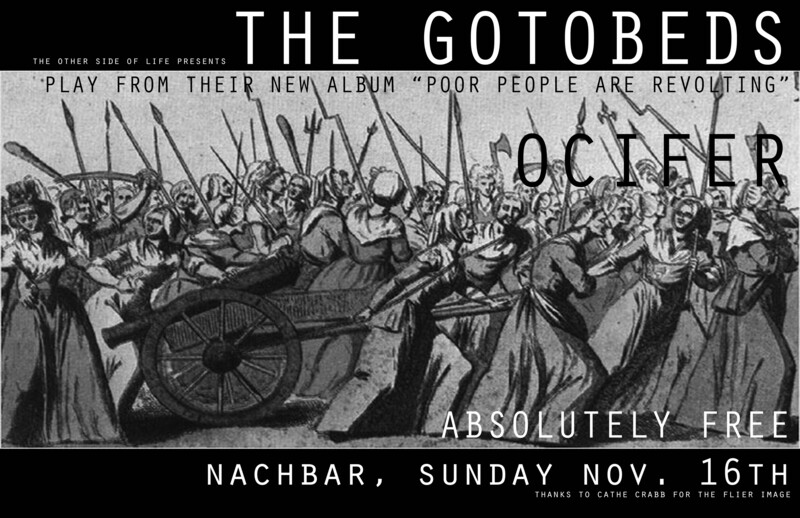 2nd ANNUAL SOPHOMORE LOUNGE FREE HALLOWEEN PARTY with JOHN WESLEY COLEMAN III, ANIMAL CITY, and GIVING UP at the NACHBAR! THE 2nd ANNUAL SOPHOMORE LOUNGE FREE HALLOWEEN PARTY! 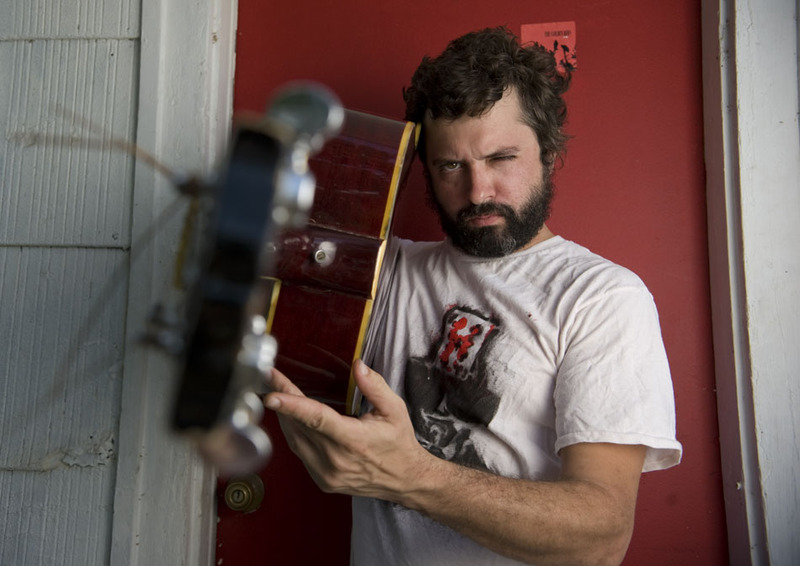 JOHN WESLEY COLEMAN III is the definition of the wildman troubador in modern times, and has certainly earned a deserved reputation with his sensibility for original, creative and bizarre recordings with both THE GOLDEN BOYS and his namesake here. The guy has a sense of weird, time-proof stoner genius bottled up “as” rock n roll that is undeniable, and gravity worked its magnetic pull. A mix of the real and the absurd in one man, with an uncanny ability to combine worldly intelligence with humor that “accidentally” hints at the sublime. Following their studio debut You Win Some, You Loser (Sophomore Lounge, 2010), Chicago’s favorite skateshop pop quartet ANIMAL CITY is back on wax with their follow-up full-length, See You In The Funny Pages. Though two and a half years without a proper record might seem like a healthy hunk of downtime, don’t let the calendar fool you. The boys have been busy. Since first forming their creative kinship nearly 7 years ago, key songwriters Sal Cassato and Dakota Loesch have knocked out a dozen-or-so collections of lo-fi, homegrown, harmonious rock jams ranging in style from stoner/loner acoustic wayfaring to full-on, funked-up and jazzed-out anthems. “I can’t deny the enjoyability that comes with a well-edited, snappy rock band like this… Even as I get older and uglier, I refuse to entirely hate anyone and everyone on the grounds that they are not as bitter as myself; bands like Animal City are chicken soup for the soul.” –Yellow Green Red. Mikie, Sean, and Jenny of GIVING UP were all snuck out of their 16 year old bedrooms to hang out and cause trouble. Now they sneak out of their respective 20 something year old major midwestern towns to return to Iowa, write songs, goof off, and feel feelings. Watch the video for GIVING UP‘s “Overdressed in Underwear” here: http://www.chartattack.com/watch/2013/10/09/video-iowa-band-giving-up-get-overdressed-underwear/. Find the Facebook invite here: https://www.facebook.com/events/1409199322642626/. 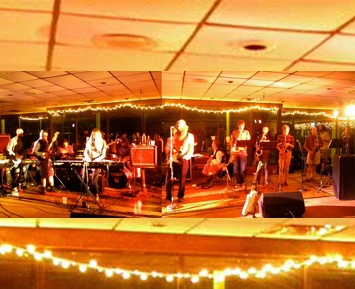 This entry was posted in Activities, Beer, Bourbon, Upcoming Events and tagged Animal City, Cropped Out, Giving Up, Halloween, John Wesley Coleman, Nachbar, Sophomore Lounge, Upcoming Events on October 14, 2013 by othersideoflife. TWIN SISTER RADIO and SALAD INFLUENCE at the NACHBAR, Saturday, March 23rd — FREE! SALAD INFLUENCE is a brand-new band from Lexington, Kentucky. Made up of Paul, Joe, and MA Turner — you might know some of those dudes from CROSS and Warmer Milks — they will thrill your socks off. Listen to them shits here: http://saladinfluence.bandcamp.com. Check out the Facebook invite here: http://www.facebook.com/events/554426371258287. This entry was posted in Activities, Beer, Bourbon, Upcoming Events and tagged Cropped Out, Free, Nachbar, Salad Influence, The Other Side of Life, Twin Sister Radio, Upcoming Events on March 12, 2013 by othersideoflife.